Posted on Wed, Aug 19, 2009 : 1:28 p.m. It's the final expletive in urban street racing. It's a collection of bold, hazardous and hair raising feats by daredevils and thrill-seekers who shake dice with death at dizzying speeds. Down harrowing inclines and treacherous turns, these heroes and fools race toward victory and certain doom. 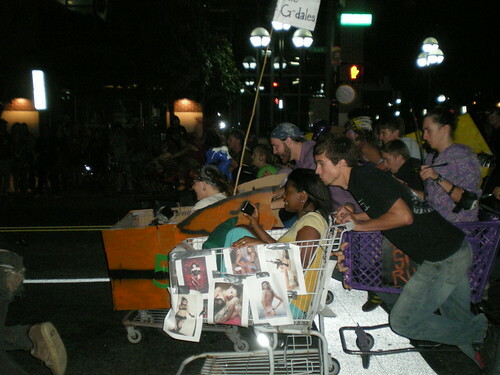 It's the Shopping Cart Race - the signature event of Ann Arbor Punk Week. Held on the seventh and final day of Ann Arbor Punk Week, it culminates a week of music, food, parties and booze. It's more popular than Burly Girls mud wrestling, more photographed than the Zombie Walk. Display 1. A taut twosome of the fittest fiber, custom clad in matching gold suits cinched tight from tip to toe. The lovely lass and the gentleman caller added preventive eyewear to the ensemble, the former curled into the curves of the cart, ready to tackle the treacherous tricks of the track. Curious onlookers and the keenest competitors gather at the Fleetwood Diner an hour before the midnight race. Necks crane, cameras flash and traffic snarls as South Ashley’s three lanes become two, become one. With 30 minutes to post, the distinctive rattle of cheap wheels and metal frames on asphalt echoes down the street, competing with the sounds of excited conversation. On the fringes, townie families hold the hands of their children, who savor the treat of a postponed bedtime on one of the last nights of summer vacation. A man with a dark goatee plays an accordion under the traffic lights, twirling softly in the middle of the street and smiling at the pretty girls with interesting tattoos. Someone in the crowd sells commemorative T shirts. Someone yells that the race will begin in 10 minutes. Display 2. A grotesque coupling of caricatures from teen years past. 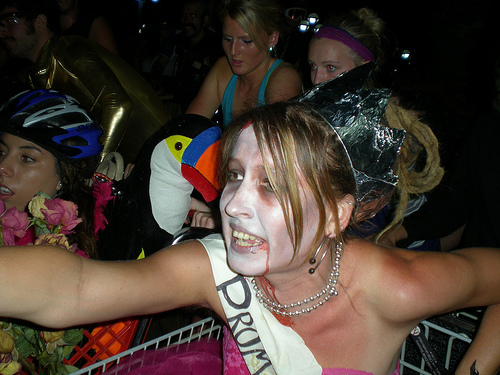 The proud Prom King, with his wisp-thin mustache, tinfoil crown and drooping sash, pushes the pink taffeta Prom Queen in her cheap pearls, wild eyes and ghoulish white complexion, gesturing wildly in the belly of her chariot. The competitors and their fans caravan four blocks to Main Street, parking across from the party store, carts massing along an imaginary starting line facing north. Teams of two to six steer customized carts, ranging from standard superstore models to a great gray shark with flashlight eyes, piloted by a nearsighted captain in suspenders. The Organizer, wearing a green army helmet strapped tight around his beard, gives the signal as he pedals his bicycle in front of the racers. Display 3. A caterwauling clash of metal on metal, cardboard on plastic, bone on skin. The brute of the ball is a lumbering beast, steered on instinct by a quartet of crafty do-it-yourselfers who maneuver a freshly purloined dumpster down the vicious course. Major Love, clad in dress fatigues, stands bravely atop the borrowed beast, playing pinochle with the Grim Reaper. Carts clatter downhill toward the finish, roughly 2,000 feet away under a railway bridge. The carts collide angrily in the guts of the race, while savvy pilots avoid the violence by maneuvering to the outside. Minimal damage is incurred in these dust-ups, but in the recklessness to win, some drivers crash their carts into concrete curbs, resulting in lost seconds and deep thigh bruises. The Prom King and Queen suffer this fate in the first hundred yards, the Prom Queen attempting to alter fate by waving her booze bottle around like an alcoholic wand. Display 4. Victorious chums, enjoying communal mouthfuls of booze from a bag of wine while the dancing lights of Johnny Law’s Justice Sedan bounce off the railway bridge. Gathered is a week’s worth of body odor, cigarette smoke, dented metal, bruised knuckles and teeth that need a good brushing. A champion is crowned. Plans to construct the ultimate shopping cart for next year are discussed, shelved. Tue, Aug 17, 2010 : 10:53 a.m. Punk week. Punk ended in 1988. You people are living in a unreality. Wed, Aug 19, 2009 : 5:21 p.m. Punk Week is a series of events (shows, the races, zombie walk, etc) held from (I think) 8/12-8/18. It's not widely publicized mostly word-of-mouth though oddly it has a MySpace page now, run by Versificators dude Jef Porkins. Wed, Aug 19, 2009 : 5 p.m. I must have got there after it ended... no racing, just a crowd and a few cop cars. What is Punk Week and how could I not know about it? Enquiring minds want to know. Wed, Aug 19, 2009 : 3:02 p.m. Wed, Aug 19, 2009 : 2:17 p.m. Excellent recap! Wish I hadn't been busy at the time.